After earning her Ph.D. from UCLA in 2002, Justine Andrews joined the faculty of the Department of Art and Art History at the University of New Mexico in 2004. Professor Andrews has worked extensively in the museum field including the J. Paul Getty Museum, the Meadows Museum in Dallas, and the National Gallery of Art in Washington, D.C. She participated in the NEH Summer Institute “Networks and Knowledge: Synthesis and Innovation in the Muslim-Christian-Jewish Medieval Mediterranean” in Barcelona, Spain in July, 2012. Professor Andrews also held a Fulbright Faculty Research Fellowship in Nicosia, Cyprus (2008), where she was in residence at the Cyprus American Archeological Research Institute. Recent publications include “Gothic and Byzantine in the Monumental Arts of Famagusta: diversity, permeability and power.” In Medieval and Renaissance Famagusta: Studies in Architecture, Art and History, edited by Nicholas Coureas, Peter Edbury and Michael J.K. Walsh. (2012). In addition to the publication of sections of her Ph.D. dissertation in Arte Medievale and the volume Under the Influence, The Concept of Influence and the Study of Illuminated Manuscripts, she has published her entire MA thesis in Επετηρἱς Κἑντρου Επιστημονικὡ Ερευὡν (Κὑπρου) [Annals of the Cyprus Research Centre], Παρἁρτημα [Annex], 2005. Currently she is working on a book that analyzes the relationship of identity to Gothic Art and Architecture from Nicosia and Famagusta, Cyprus. 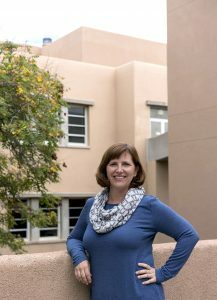 At UNM she offers courses on Western Medieval, Byzantine, and Islamic Art and Architecture with a special emphasis on the interaction between these cultures.